(5 stars) USB ports as far as the eye can see! This hub is a great addition for my cluttered desk. With proper placement and cable management it cleaned up and centralized all my USB cables I previously had running to front, back, and side USB ports. The fast charge ports are clearly marked and accessible and are great for connecting a cell phone or tablet. Though it might not be initially evident, one is able to charge devices with the non-fast charge ports when connecting the hub to a PC, albeit slowly. External power requirements often serve as a deterant for me on products like this with 10 ports and fast charging it is easy to makes this an exception. I received this product in exchange for an unbiased review. You can never have enough USB ports but this comes close. Easy to install and works great. I am not a big fan of having to use an external power source but having 10 usb ports is worth it. (3 stars) It just works. Best if mounted. OK, negatives first. --My unit arrived with the rubber feet only on one side, and the hub is really light, so it moved all over the place. The rubber on the two corners WAS slippery too. Replaced all four feet with a bit of non-slide shelf liner. Stays put. --The mounting holes on the back are slotted such that if you mount the hub horizontally with the 8 ports facing down, it will come loose when you plug anything in (I prefer the cords to face down when mounting something like this sideways--so this one is more preference. Now the good: --It just works. The charging ports do exactly as described, and function even if there's no computer connected. --Connected to a computer (which is on), I was able to trickle charge on more than just the 2 "charging" ports, so nice touch there. --Port separation is good, so all ports could be used at one time. --Full speed. :) --Indicator lights being up on the slanted peak is great. Can see them from almost any angle. Oddly enough, this was a standout feature for some reason. I received this product in exchange for an unbiased review. Well my prayers have been answered. 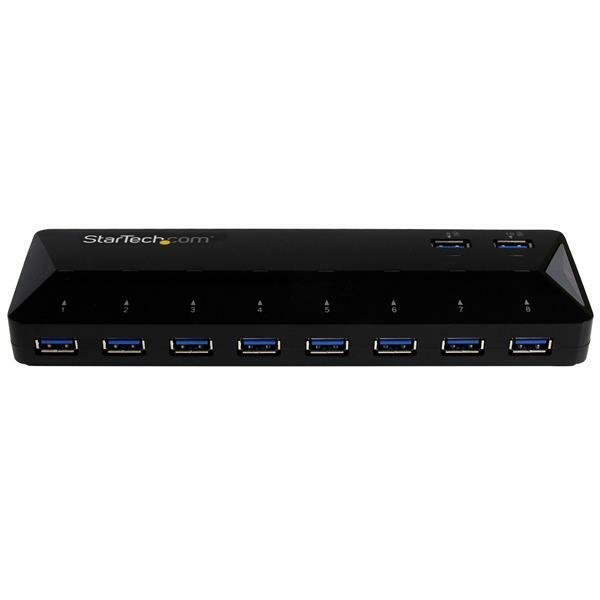 This is the an uber usb 3.0 hub / charger. I run mostly on laptops that have few usb ports of any kind. Now I can connect up to 10 USB devices as well as being able to full charge on 2 of them. This device needs to be plugged in, no device drivers need to be installed on windows or mac for it to work - just needs power for full functionality as the USB 3.0 does not provide enough power to support the full functionality. Right now I have charging 2 phones (iPhone and android), and have 5 usb devices plugged in. My computer has never been so happy. I am using a variety of usb devices and adapter based on SD, microsd, etc. I have used USB hard drives as well without issue. Conveniently this device comes with a soft power switch and needs to be plugged in for full functionality. With it's glossy black exterior and blue LED lights to indicate enabled ports, it looks great. Delivery was fast and painless. It comes with international power plug adapters. I found the box it came in could have been a little smaller but no biggee as cardboard is recyclable. I have tested this on Windows 10 and Mac OSX without an glitches or problems. 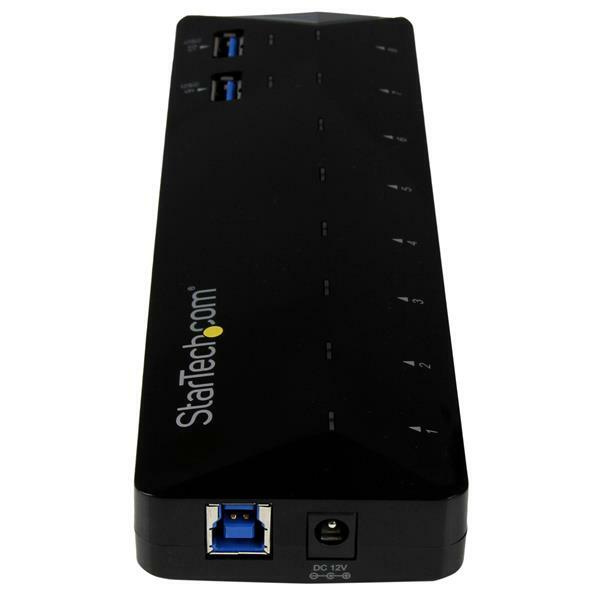 This products comes with StarTech's great 2 year warranty and lifetime tech support. Online manuals as well if you don't like the included manual. 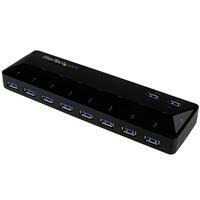 All in all, this is the best of the best as far as USB 3.0 hubs go. I will never go wanting for a place to plug in a USB device. Well done. I received this product in exchange for an unbiased review. Overall i found this product does what it is intended to do. I was happy that Startech had included wrapped around the unit a "read before use" to explain the Fast charge functions otherwise I really would not have understood the meaning or how it functions. Good work Startech for explaining this!! The dock works well and I had no connection issues at all it works pretty flawlessly. My only complaint is i find this hub too light. I find light hubs and docks move too much when you plug in cables. The dock ends up moving by the force on the cables. I want the dock to stay in one place and the cables to be moved. A little more weight to the dock and it would stay in one place. Overall can't complain about function. I received this in exchange for an unbiased review. The USB 3.0 give the speed and flexibility with 10 ports to charge phones, iPads, and other devices. The build quality is excellent and packaging to help describe contents is always a plus. Also smaller than I thought is always a bonus. 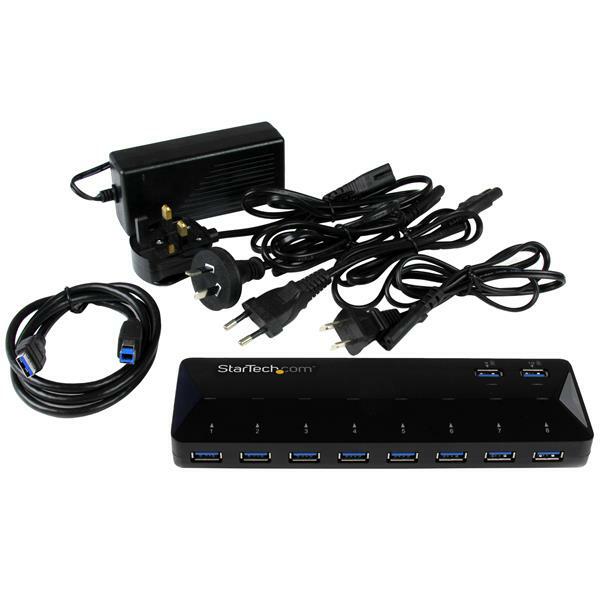 I Bought this 10 port hub on Amazon, hooked up an external hard drive, I could not get all the files and folder to copy to my external drive for backup many of them were missing this is very disastrous for me. any solutions? We apologize for this odd behaviour you've experienced with our ST103008U2C and want to look into it further with you. I've reached out directly by email and can troubleshoot with you there.